Dholavira is an most prominent archaeological site at Khadirbet in Bhachau Taluka of Kutch District,in the state of Gujarat in western India,which contains ruins of an ancient Indus Valley Civilization/Harappan city.One of the unique features of Dholavira is the sophisticated water conservation system of channels and reservoirs,the earliest found anywhere in the world and completely built out of stone,of which three are exposed.Dholavira had massive reservoirs.They were used for storing the freshwater brought by rains or to store the water diverted from two nearby rivulets.This clearly came in wake of the desert climate and conditions of Kutch,where several years may pass without rainfall. Also we find a large number of tanks were cut in the rocks to provide drinking water to tradesmen who used to travel along the ancient trade route.Each fort in the area had its own water harvesting and storage system in the form of rock-cut cisterns,ponds,tanks and wells that are still in use today.One such Water tank at Mohenjo-daro shown in above picture. 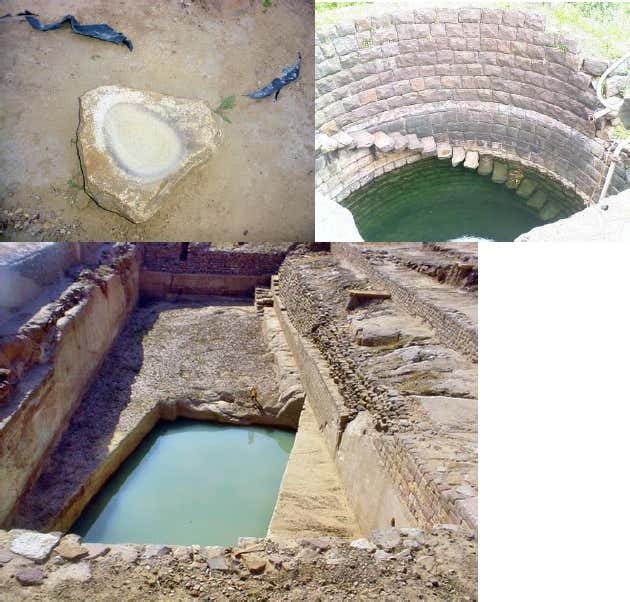 All above shows that irrigation was well recognized from the dawn of civilization and these Indus valley people were claimed to be the ancestors of tamil people.When Indus valley people migrated to south India after it collapsed during 1700-1500 BC,they may also carry these knowledge of irrigation & its importance with them.But the sangam literary works from which we usually derive materials for our study about ancient south india or Tamils,do not clearly mention the provenance of the use of such devices,the water wheel. 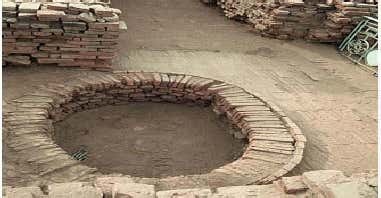 However,the application of water-lifters & other simple devices in south India is unmistakably mentioned in the following works such as:Akananuru-a sangam work,Maduraikanchi-one of the Pattu paatu,Silappathikaram & Manimekalai-the two tamil epics, Periyapuranam & so on.Besides a number of early tamil epigraphs also make definite mention about picotahs[similar to the shadoof] & palm-leaf baskets. Also we come to know that the agriculture scene of South India was equally bright in Ancient India.The Tamil people cultivated a wide range of crops such as rice,sugarcane,millets,black pepper,various grains,beans,cotton,tamarind and sandalwood,Jackfruit,coconut, palm,areca and plantain trees etc and Systematic ploughing,manuring,weeding,irrigation and crop protection was practiced for sustained agriculture in South India. Further,due to the many handicaps such as failure of monsoon,the uneven rainfall,its scarcity & excess etc had forced the ancient tamil people of south india,to carry on irrigation by means of artificial reservoirs or canals.Historically It was the sangam king Karikalan who as a pioneer,actually engineered the above idea. In the earliest Tamil grammatical treatise Tolkappiyam ,dated 5th century BC,we find a line which says:"வருவிசை புனலைக் கற்சிறை போல ஒருவன் தாங்கிய பெருமையானும்"in its poruladikaram.Here "kaṟ-ciṟai"[கற்சிறை] means dam, anicut, embankment. Further,pattinappalai of poet Uruttirangannanar in praise of the Chola king Karikala, mentioned in lines 283-284 that "He[King Karikala] cleared woods & habitable made,constructed tanks & prospered the land"
the water to run through the sluices." where storks catch carp[fish] in the fields and rest on piles of grain." From above sangam poems We come to know that During the sangam period[700BC to 300AD] Kings considered agricultural development as their primary duty,Also They felt that soil fertility and irrigation facilities should be the country’s assets.& as such they dug tanks at locations where water flow from rains was plentiful and Semicircular bunds were raised adjacent to small hillocks. Even The king Karikal Cholan brought 1000 slaves from a conquered country and raised the bunds of river Cauvery.Thus indicates awareness of water harvesting during the ancient tamilakam..
Further we come across different type of "Water reservoirs" in tamil language such as:"இலஞ்சி(Reservoir for drinking and other purposes),கண்ணி,எரி(Irrigation Tank),மடு(Deep place in a river),வாவி[tank,reservoir of water,lagoon],வட்டம்,நளினி ,கயம், கோட்டகம்,மலங்கன்,சலந்தரம்,தடாகம்[pond],கிடங்கு[Pit,depression],கற்சிறை[anicut],கிணறு[well],துரவு.அகழி(Moat), அருவி(Water Falls),ஆழிக்கிணறு(Well in Sea-shore),ஆறு(River),உறை கிணறு(Ring Well),ஊருணி(Drinking water tank) ,ஊற்று(Spring),ஓடை(Brook),கட்டுக் கிணறு(Built-in-well),கண்மாய்(கம்மாய்/Irrigation Tank),கலிங்கு(Sluice with many Venturis),கால்(Channel),கால்வாய்(Suppy channel to a tank),குட்டம்(Large Pond),குட்டை(Small Pond),குண்டம்(Small Pool), குண்டு(Pool),குமிழி(Rock cut Well),குமிழி ஊற்று(Artesian fountain),குளம்(Bathing tank),கூவம்(Abnormal well),கூவல் (Hollow),வாளி(stream),கேணி(Large Well),சிறை (Reservoir),சுனை(Mountain Pool),சேங்கை(Tank with Duck Weed),தடம் (Beautifully Constructed Bathing Tank),தளிக்குளம்(Tank Surrounding a Temple),தாங்கல்(Irrigation tank),திருக்குளம்(Temple tank), தெப்பக் குளம்(Temple tank with inside pathway along parapet wall),தொடு கிணறு(Dig well),நடை கேணி(Large well with steps on one side),நீராவி(Bigger tank with center Mantapam),பிள்ளைக்கிணறு(Well in middle of a tank),பொங்கு கிணறு(Well with bubbling spring),பொய்கை(Lake),மடை(Small sluice with single venturi),மதகு(Sluice with many venturis),மறு கால்(Surplus water channel),வலயம்(Round tank),வாய்க்கால் (Small water course)",totalling over 50 such words.Do any other language have such number of words to describe "Water reservoirs"?If not,Why Tamil language have such number of words?Because ancient tamil civilization had realised the tremendous value of water in human life.Apart from cooking,personal cleanliness and hygiene,water was vital for cultivation and irrigation of crops.Not only that,In that early age,water was a major mode of transport too;Since tamilian life is centred on water and agriculture,the importance of keeping these structures well-oiled was not lost on the community.Ways were devised to retain the incoming water based on the requirement of the village and the excess was allowed to flow into the next tank in the series.This is why Tamils have such number of words.